Cook millet in a pot of 1 cup water and some salt. Bring to a low boil. Reduce heat to low and cover with tight-fitting lid. Simmer 15-20 minutes or so. Remove from heat and let sit for 5 minutes covered. Remove lid and fluff with fork. Set aside. I used bulgar and cooked it the same way. Meanwhile, grab a large skillet and heat oil over medium heat. Add in chopped onions and garlic and sauté for 5 minutes. Add sliced mushrooms and sauté for 12 minutes longer, stirring as necessary. Now sitr in rosemary, yeast, and soy sauce. Cook for a few minutes longer. In small bowl, whisk broth and cornstarch until clumps are gone, and then stir into the mushroom mixture. Stir in kale. Cook for another 5-6 minutes or so, until slightly thickened. Portion millet into two bowls and serve mushroom gravy on top. 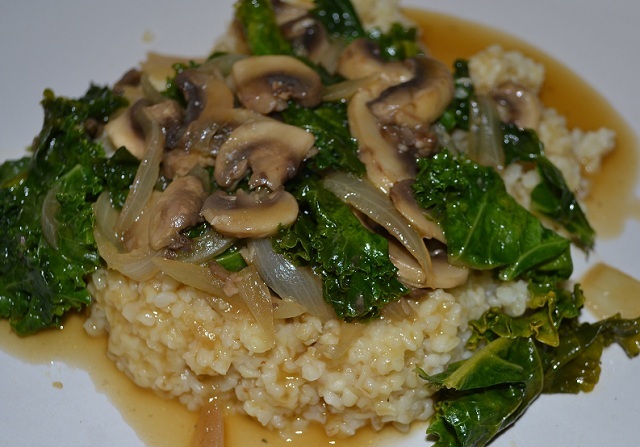 This Vegetarian Millet Bowl with Mushrooms was a great recipe. It was rich and delicious. I will be trying this one again, but next time I will try to find millet. In a pot, prepare gnocchi according to package directions. Meanwhile, in a large skillet, melt butter over medium-high heat. Add onion and cook about 5 minutes. Add mushrooms and cook until mushrooms are tender and liquid has evaporated, about 5 minutes. Stir in asparagus, broth, cream, and black pepper; heat to boiling, stirring. Boil 3-5 minutes, until asparagus is tender. Drain gnocchi; return to saucepan. Add mushroom mixture; toss well. 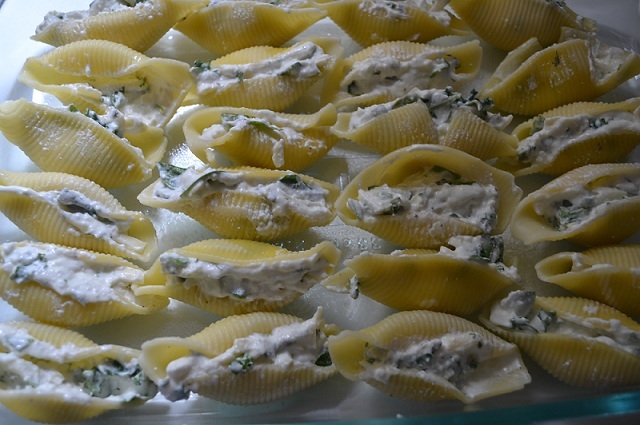 Serve with Parmesan cheese if you like. Since giving up meat, I have tried many different vegetarian recipes, but this Stewed Vegetable Gratin Recipe still my family’s favorite. This dish is incredibly tasty and satisfying. It gives you beans, veggies, cheese, and bread all in one. Not only that, it is very easy to make. I must say it’s a little time consuming having to cut up all those veggies into small enough pieces to make sure it cooks well, but it’s worth it. I also like to double the recipe and make 2 dishes. I freeze one so I can easily pull it out and pop it in the oven on the nights that I don’t have time to cook. Heat oven to 400. Heat 1 tbsp oil in a large saucepan over medium-high heat. Add the onion, celery, and carrots. Cook, stirring occasionally, until veggies begin to soften, 3-4 minutes. Add tomatoes and their liquid, ½ cup water, salt, and pepper. Bring to a boil. Add the chard and simmer, stirring, just until wilted, 1-2 minutes. Stir in the beans and 1 cup of Parmesan. Transfer to an 8×11 baking dish or shallow 2 quart casserole. Cut the baguette in half crosswise, then lengthwise, into ¼ inch thick slices. Brush one side of each slice with the remaining oil. Arrange the slices, oiled-side up, over veggies, overlapping slightly. Sprinkle with thyme and the remaining Parmesan. Bake until bread is golden brown, 15-20 minutes.